Good afternoon! I hope you are all having a great Thursday! 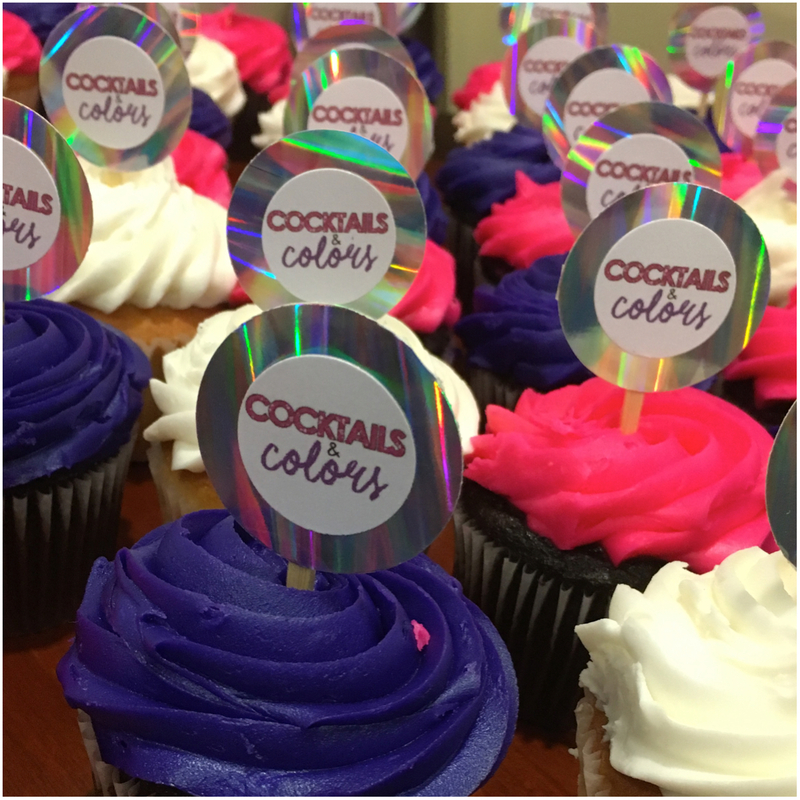 Today we are going to take a look at this year’s Cocktail & Colors event. 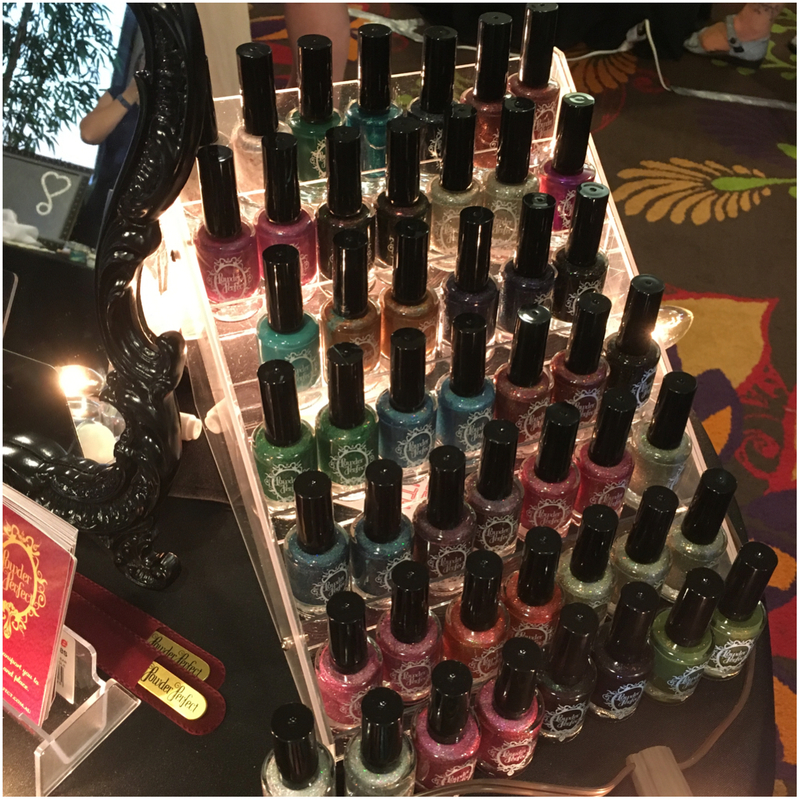 Cocktail & Colors is the indie nail event that takes place after hours during Cosmoprof. 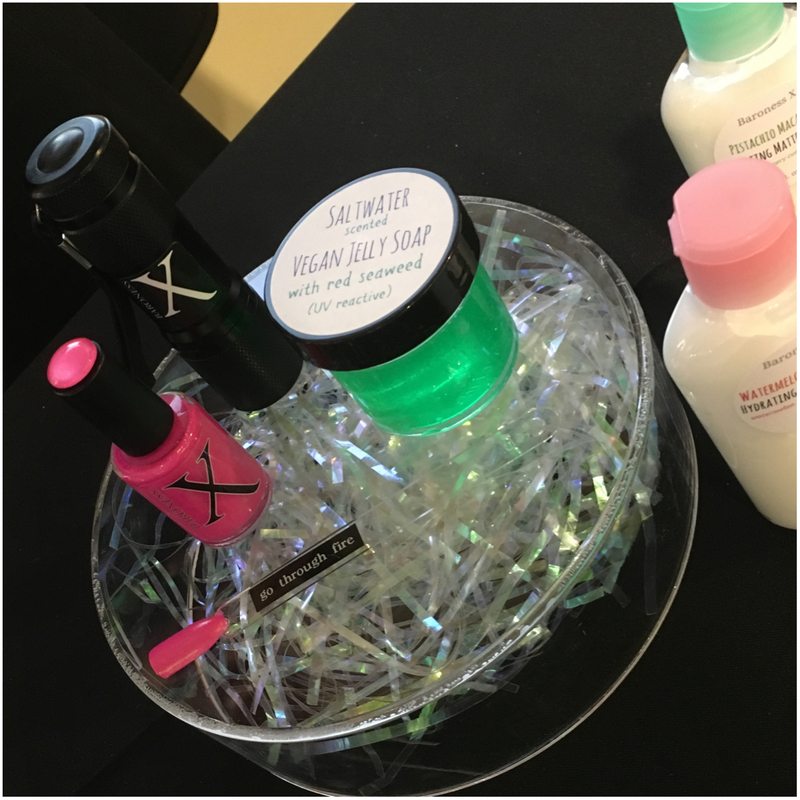 While this event does not have any relation to Cosmorprof, the timing is perfect because so many indie makers and blogger are in the same area at the same time. 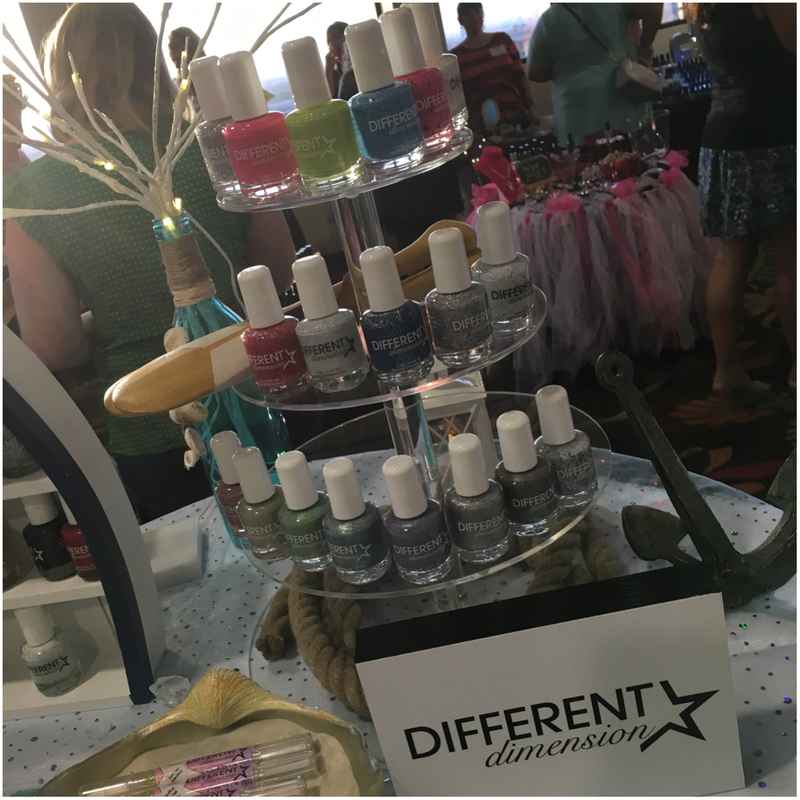 This year’s event was hosted by Different Dimension, Glisten & Glow, and Cupcake polish and included tons of great indie brands. Today’s post will be VERY picture heavy but I hope you all take a moment to check out the maker’s gorgeous tables and you take the time to visit each one. Let’s get started! 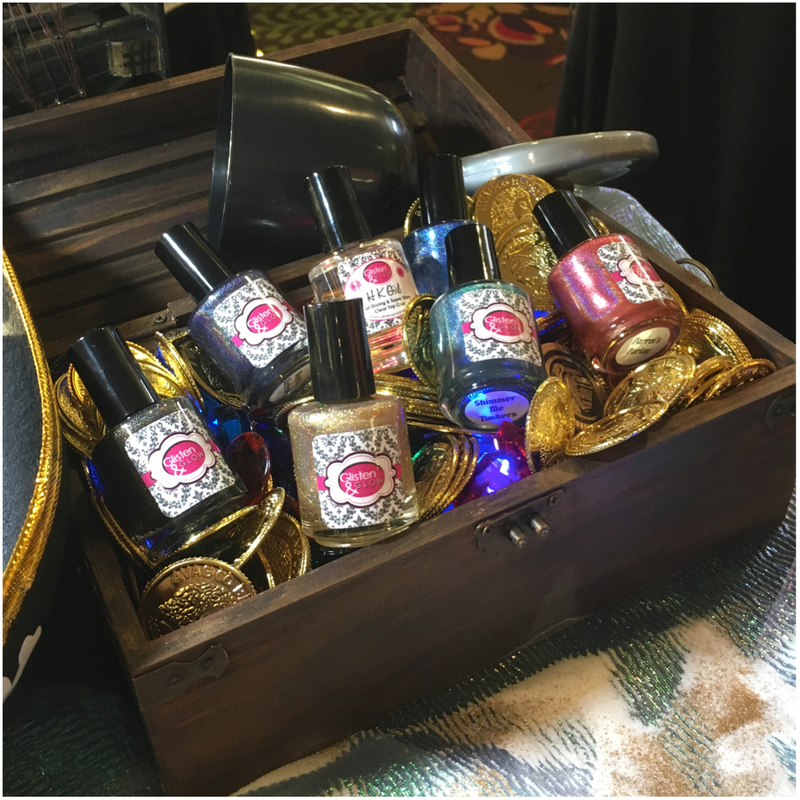 First up we have the cute pirate shipped them table from Glisten & Glow. 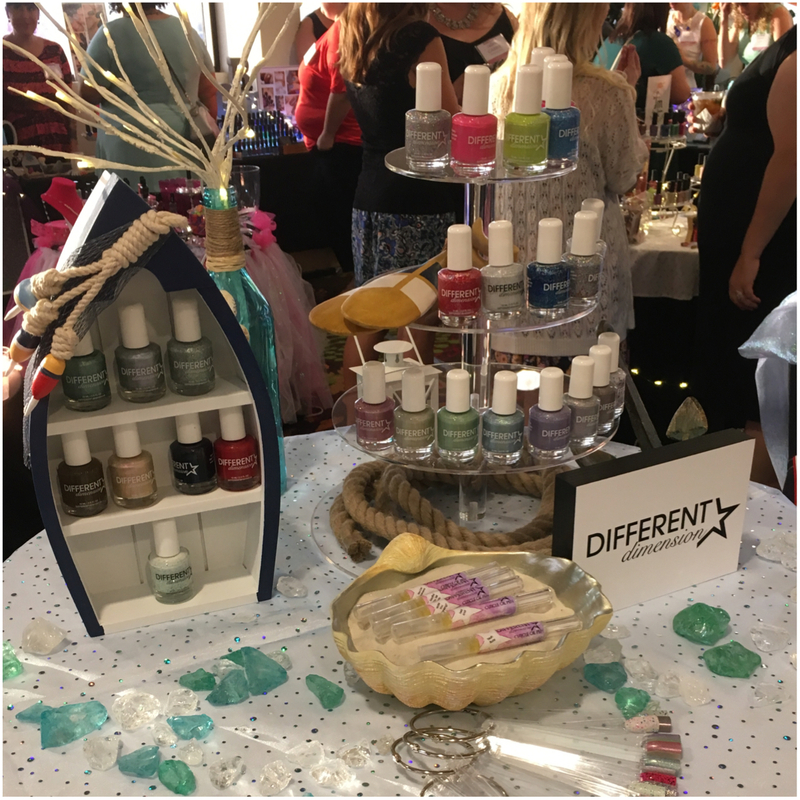 This year Jill was highlighting the new Experience the Islands collection and the upcoming Pirate’s Booty collection. 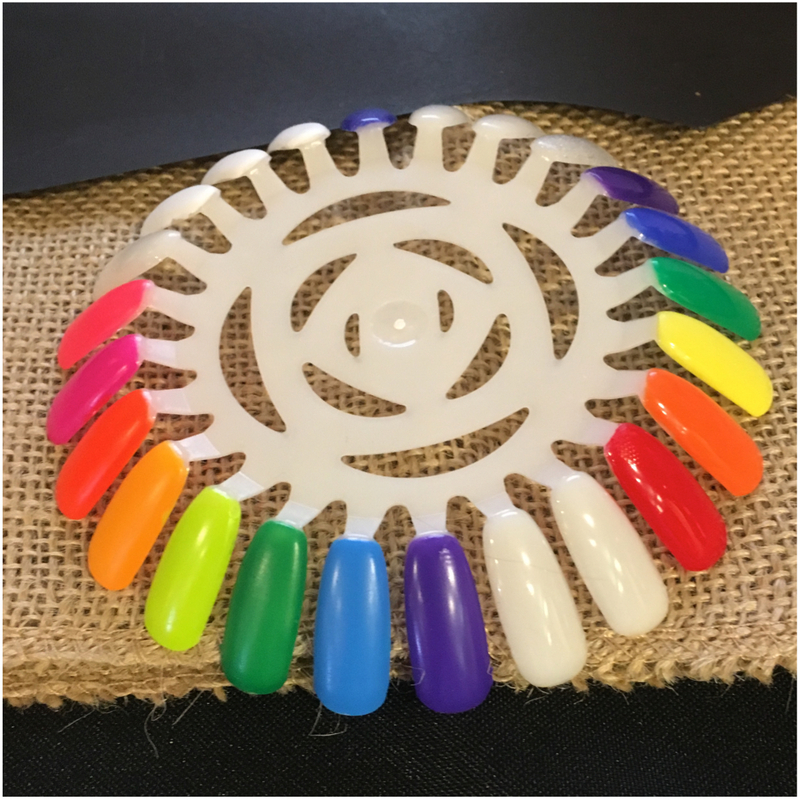 These lacquers were absolutely gorgeous and I can’t wait to share more in the near future! 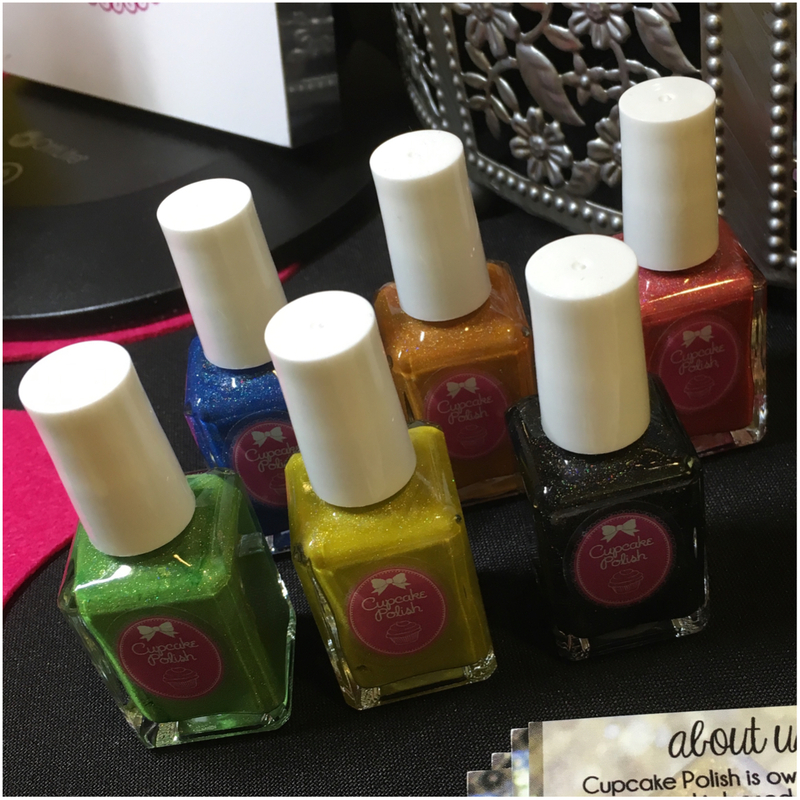 Next up we have Cupcake Polish. 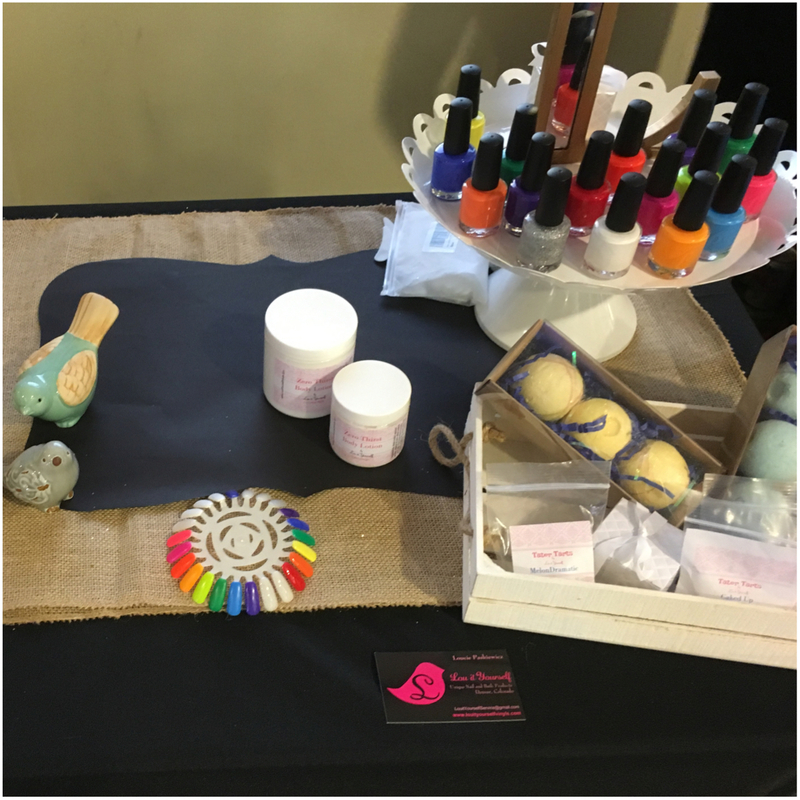 Again we have another adorable display! 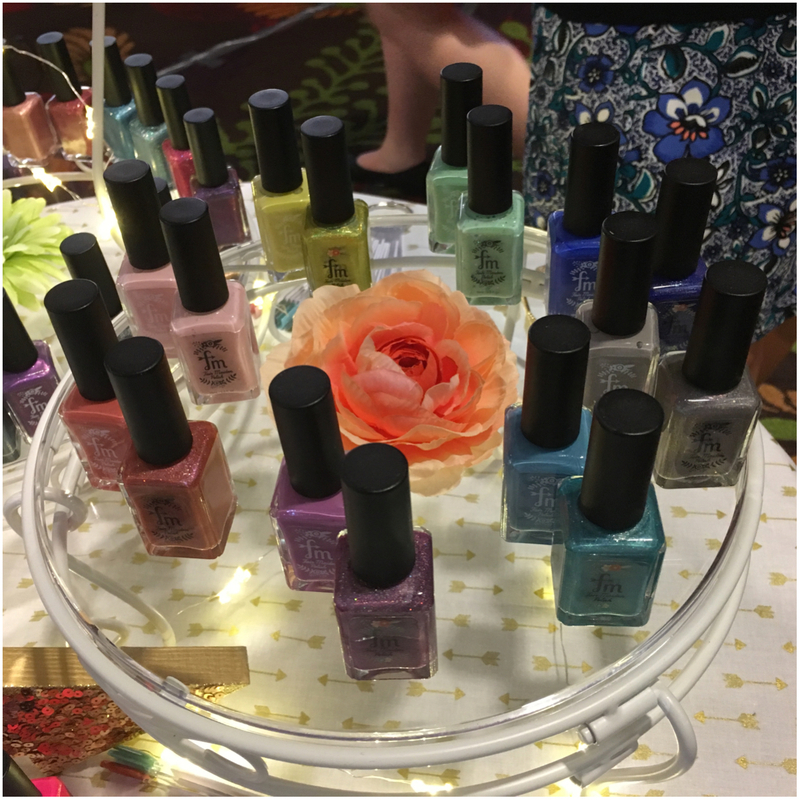 I alway love the bright colors from Sara and then new Luau Collection is just fabulous! 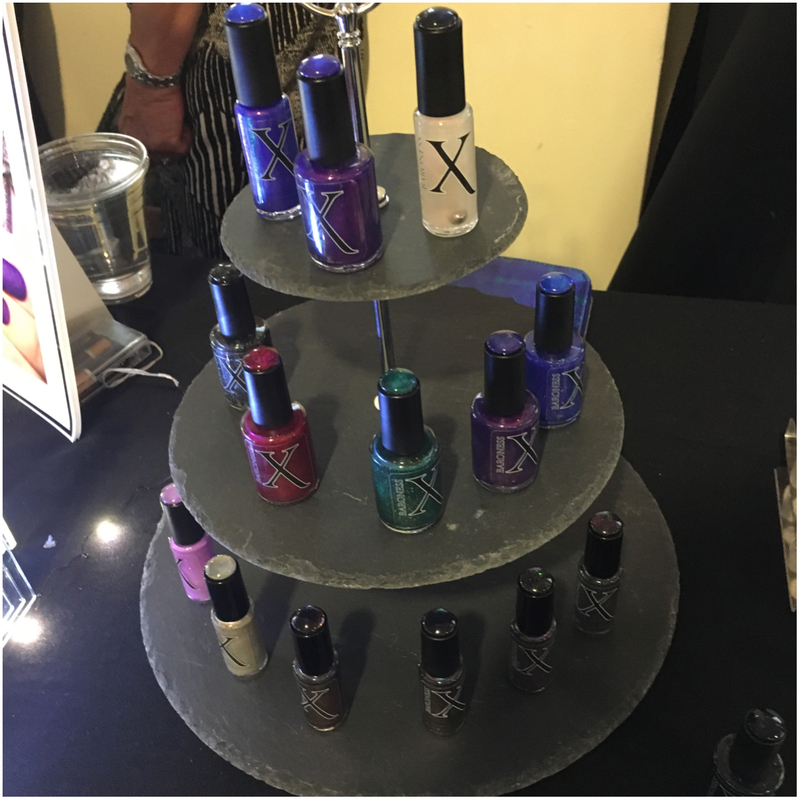 I will be sharing three of the six new lacquers later this month. Until then check out the awesome Olympic Collection! Now for the third host of the year, Different Dimension. 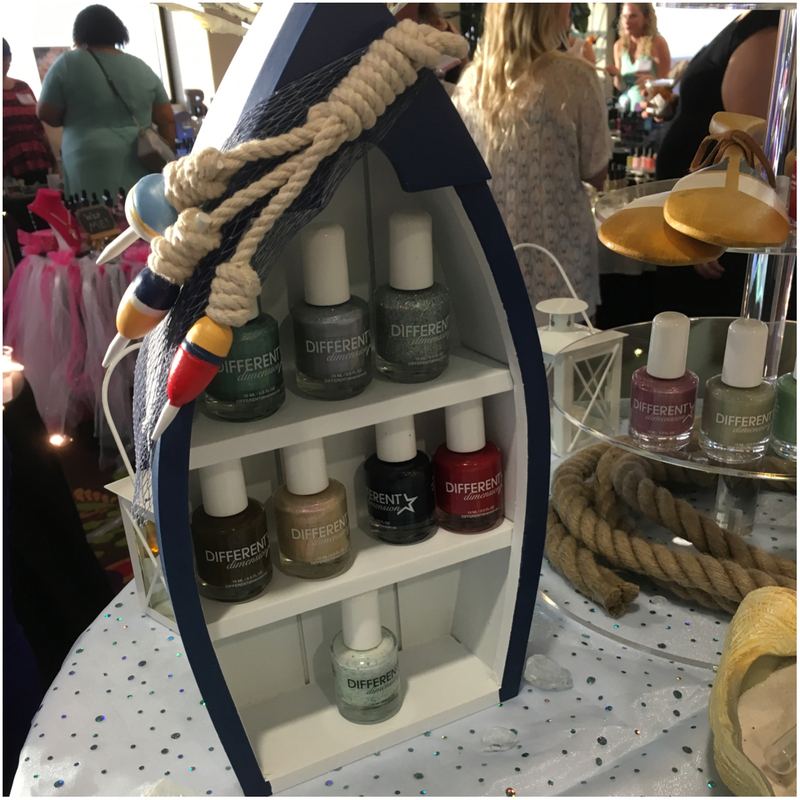 This year Missi was showing off her new collection cutely named Pretty Nauti. This is a 8 piece collection and I will be sharing three of these tomorrow for release. 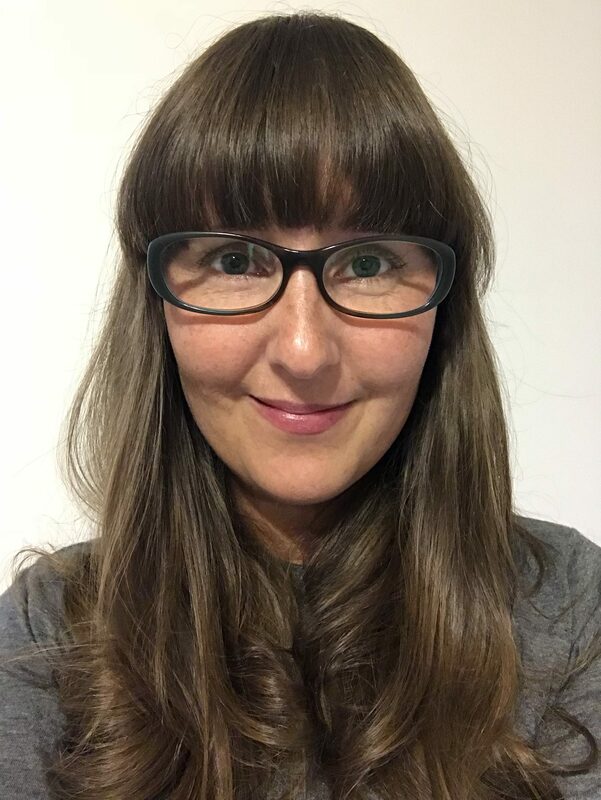 Next up with have the amazing Pam from Girly Bits. 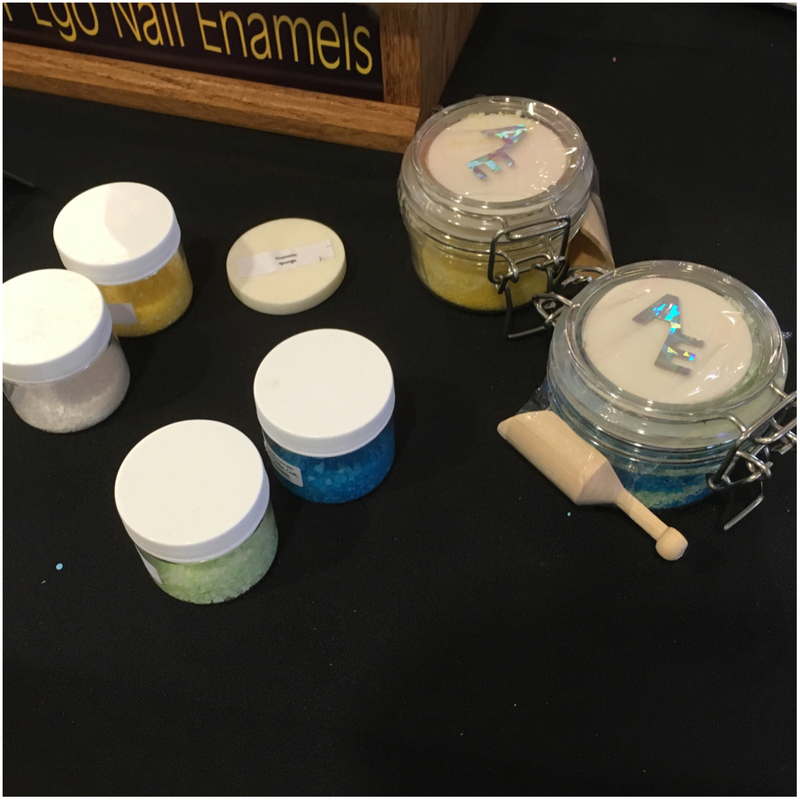 I loved the holographic signage and the opportunity to check out some of her stamping line. 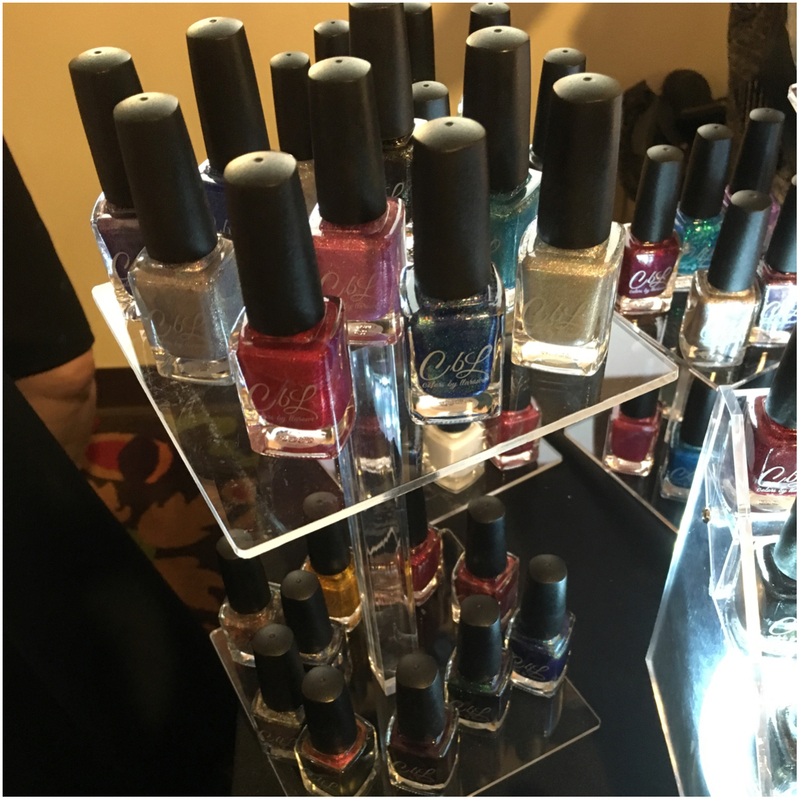 Along with showing off the new A Little Madness Collection, she was displaying her upcoming duo with Firecracker Lacquer. 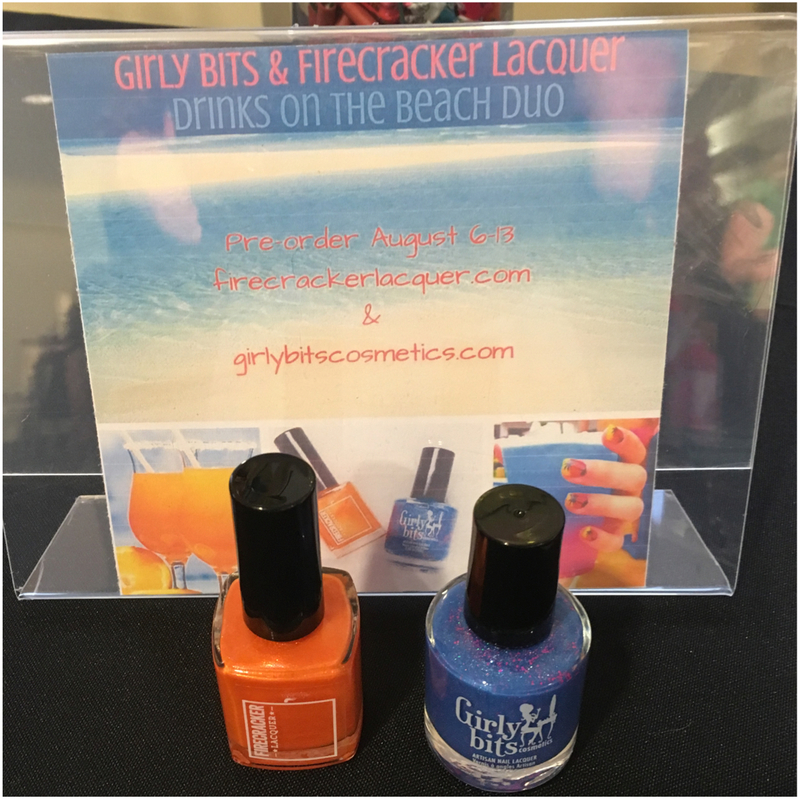 This duo is titled Drinks on the Beach and is the perfect closure duo for summer. 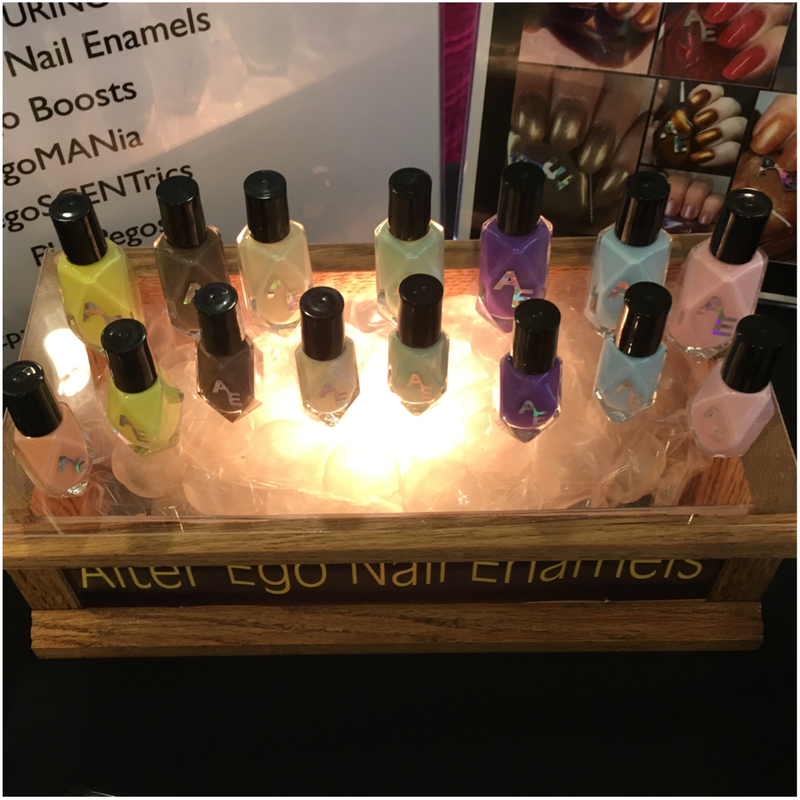 Now for some Alter Ego! 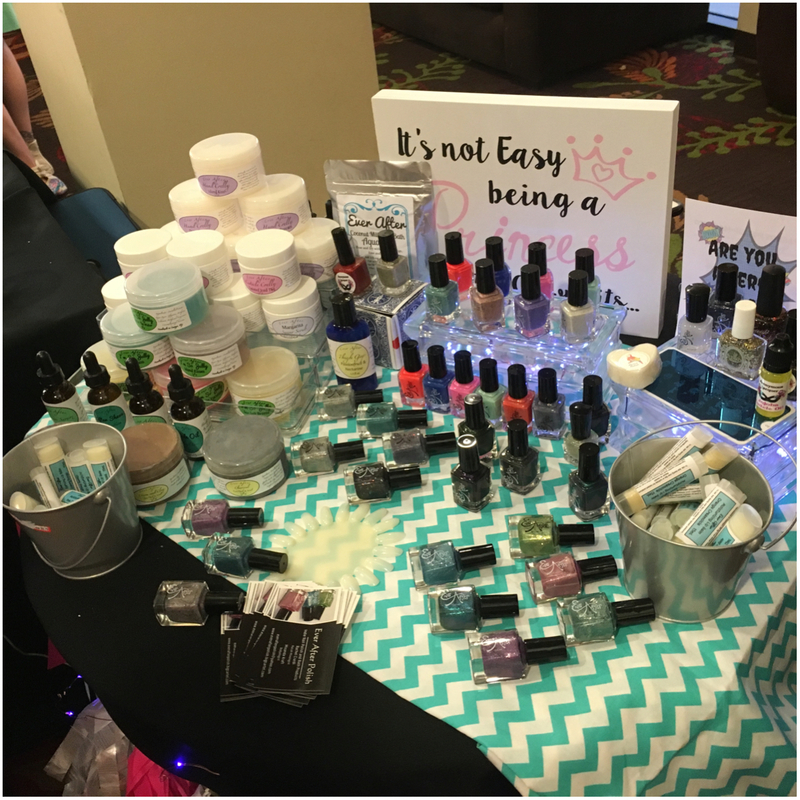 Cynthia was showing off her new Scream for Ice Cream Collection and tons of her great bath and body products. Cynthia was fabulous as always and it was great seeing her again. Now for some 6 Harts! 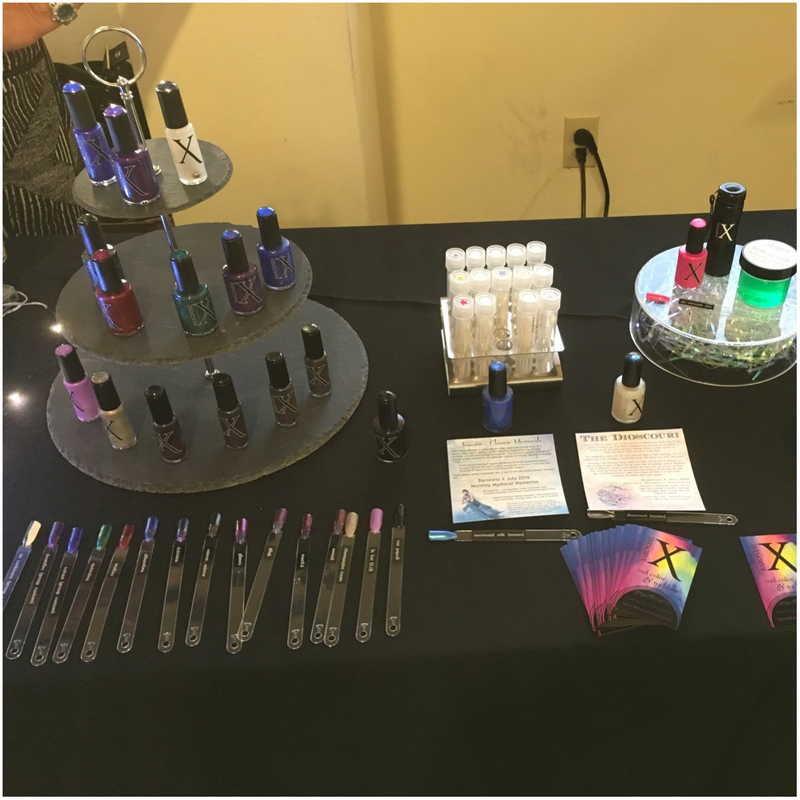 Courtney was true doll as always and I love getting to check out a few of her gorgeous lacquers. 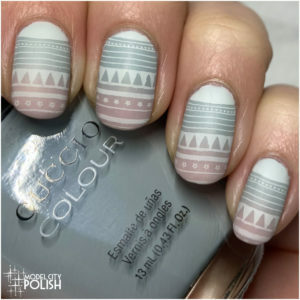 Next up we have Native War Paints. 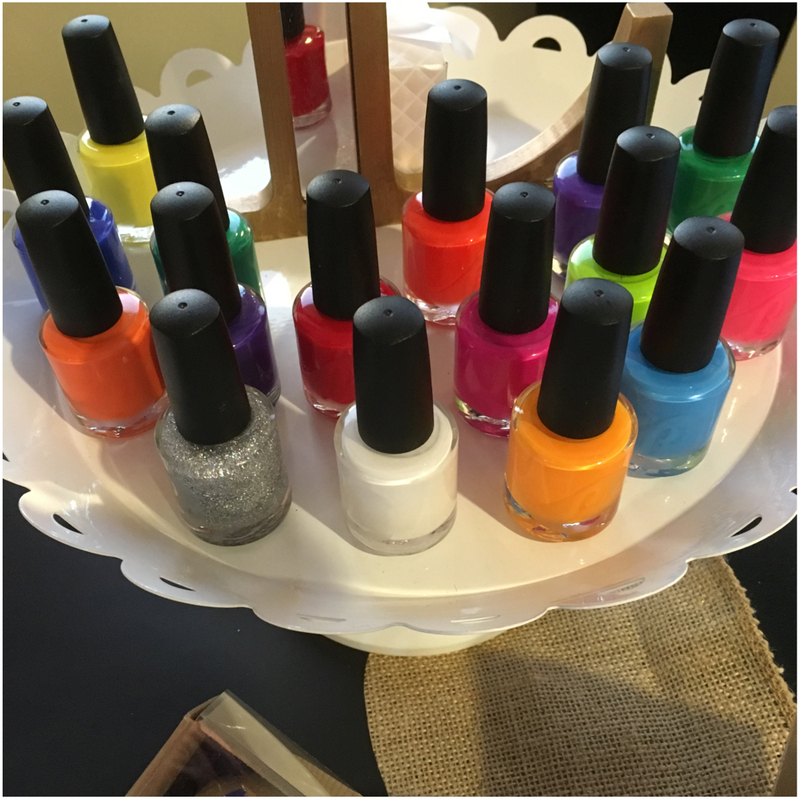 Wow, these lacquers were bright and stunning! 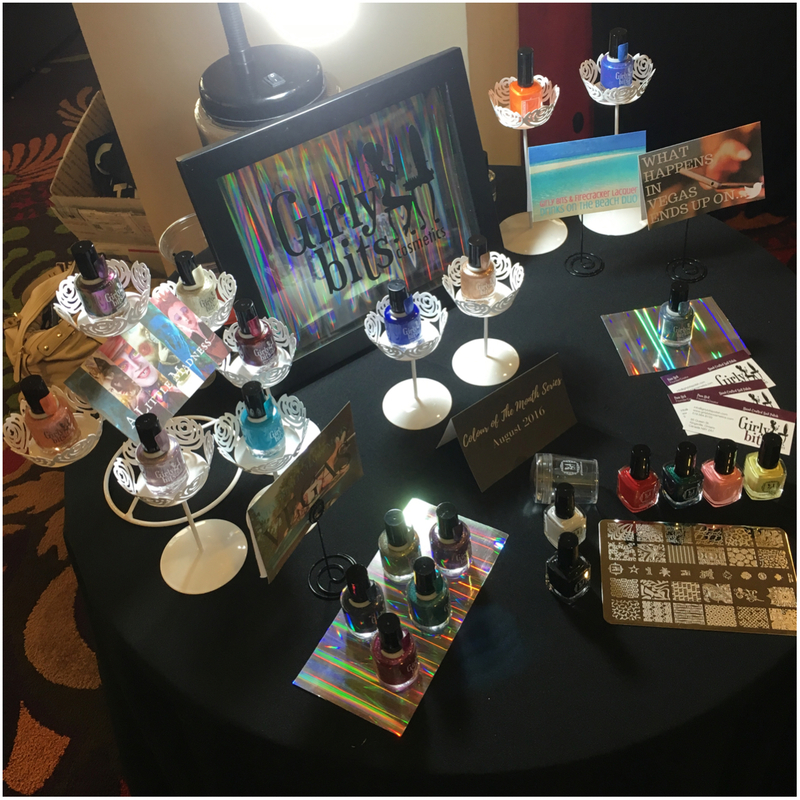 Amanda was so sweet and I loved the opportunity to check out some of her lacquers in person. 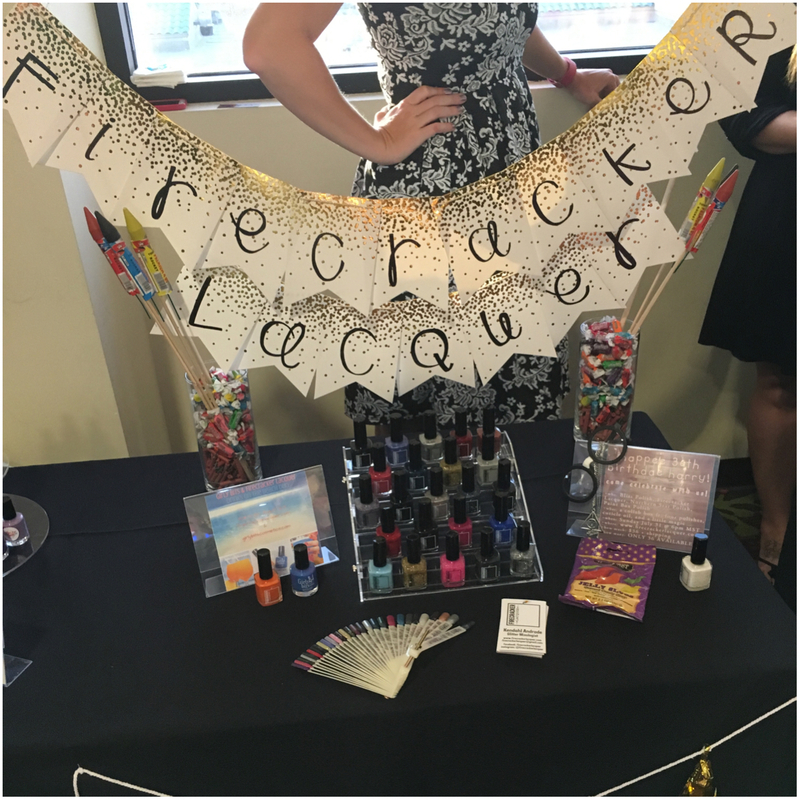 Now for the always awesome Firecracker Lacquer! 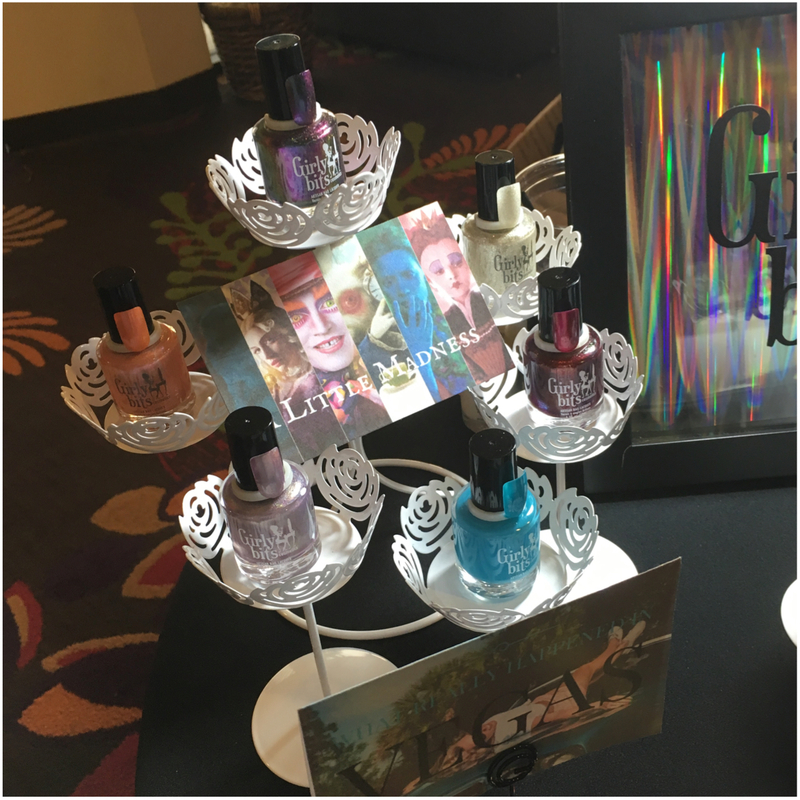 I always love their cute displays and Kendahl was fabulous! 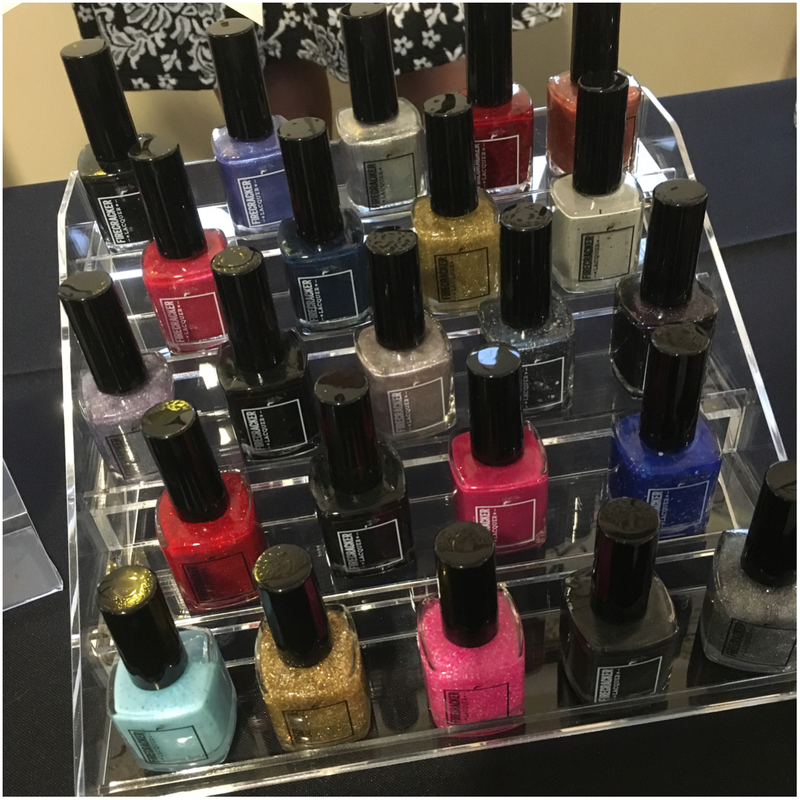 She had tons of great lacquers on display, including her duo with Girly Bits. I love how electrifying the orange is! 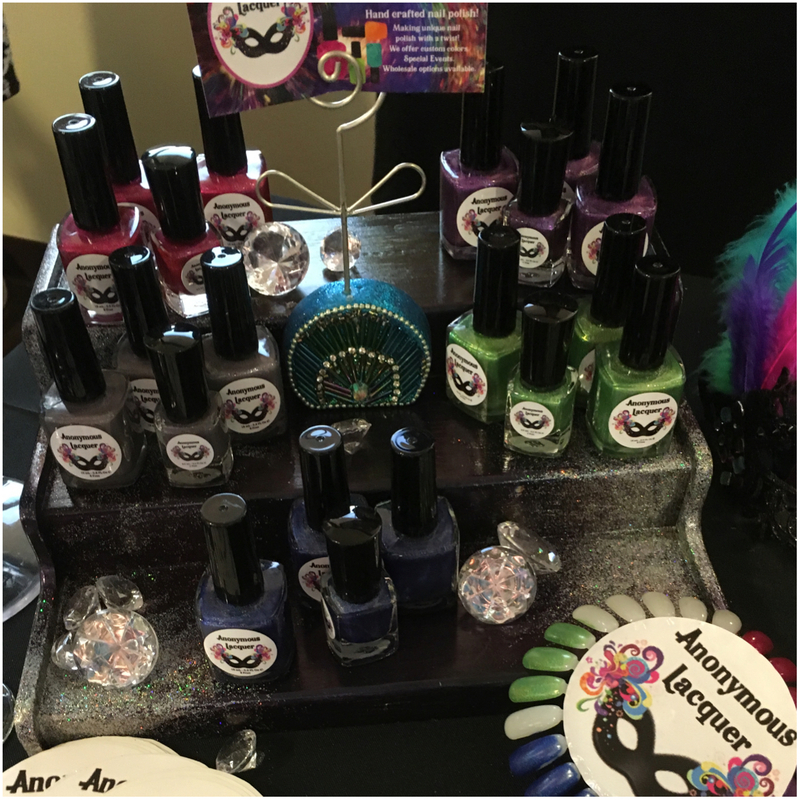 Next up we have Anonymous Lacquer. 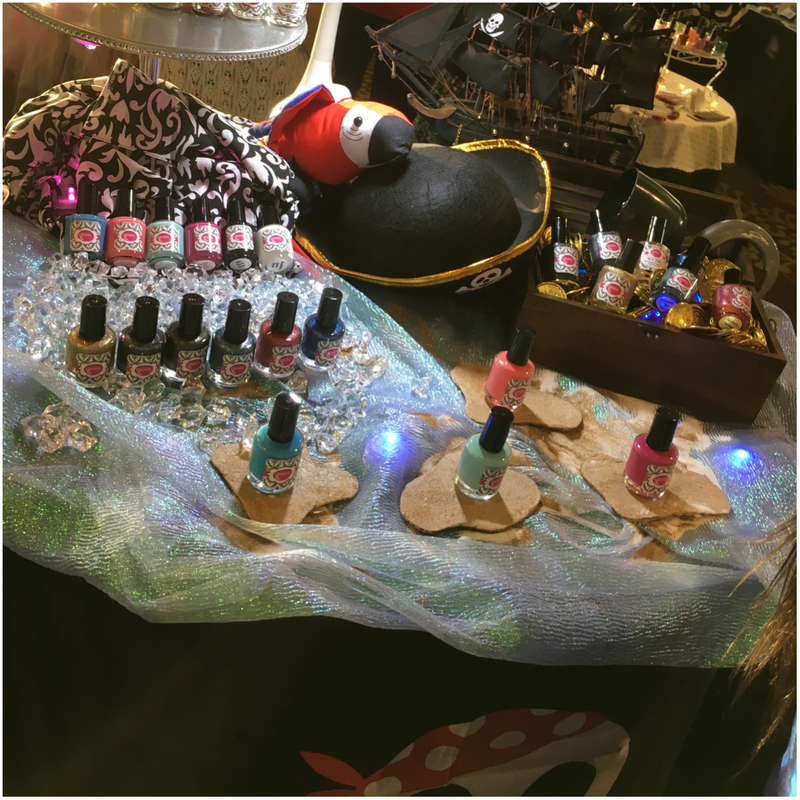 Mildred’s display was so fun and cute! 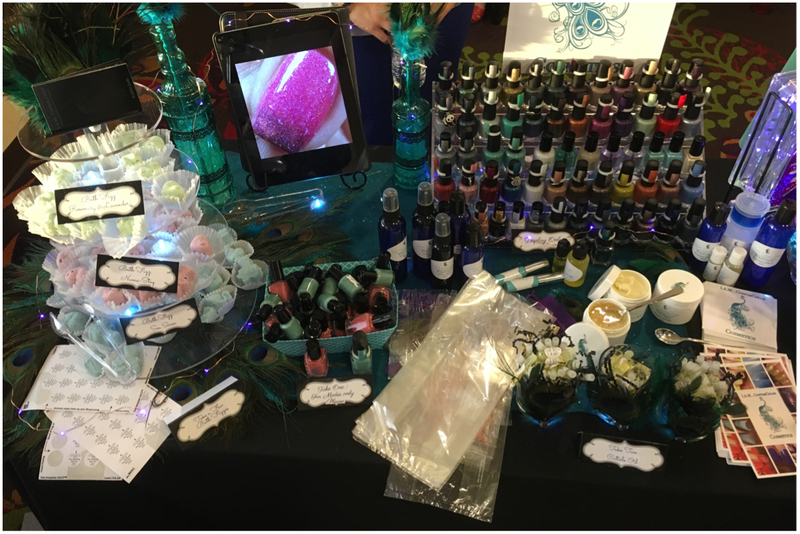 She had some gorgeous lacquer, and was displaying her upcoming duo with Ever After Polish. 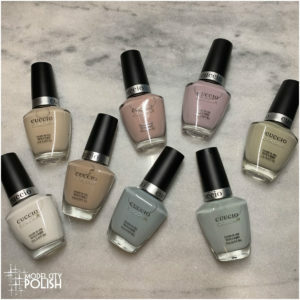 Now for a brand that I have been eyeing for sometime now. I love the unique look of Baroness X and the added color gems on top of their bottles is pure genius! I finally got to check out a few of those lemmings and they certainly moved up on my list. 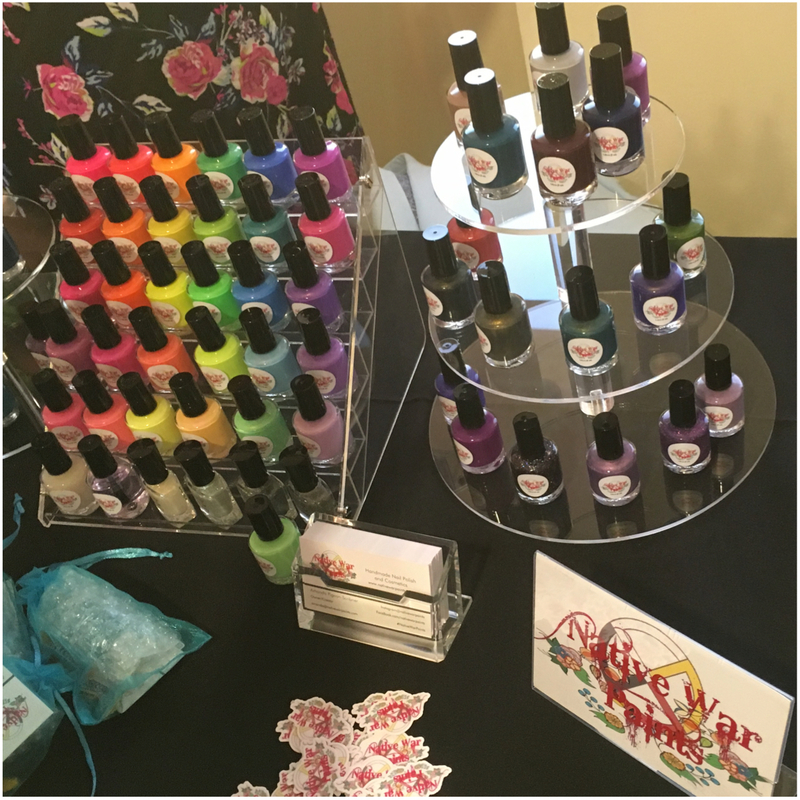 Not only do they offer lacquers, they have a great hand care line too with some amazing smelling lotions. 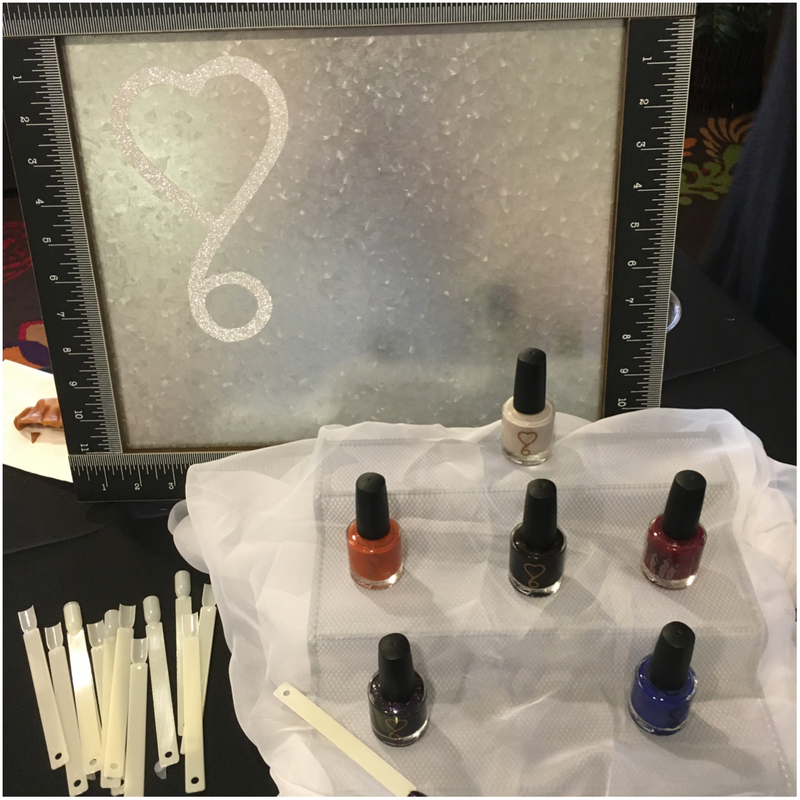 Now for a I,A.M….Custom Color Cosmetics. 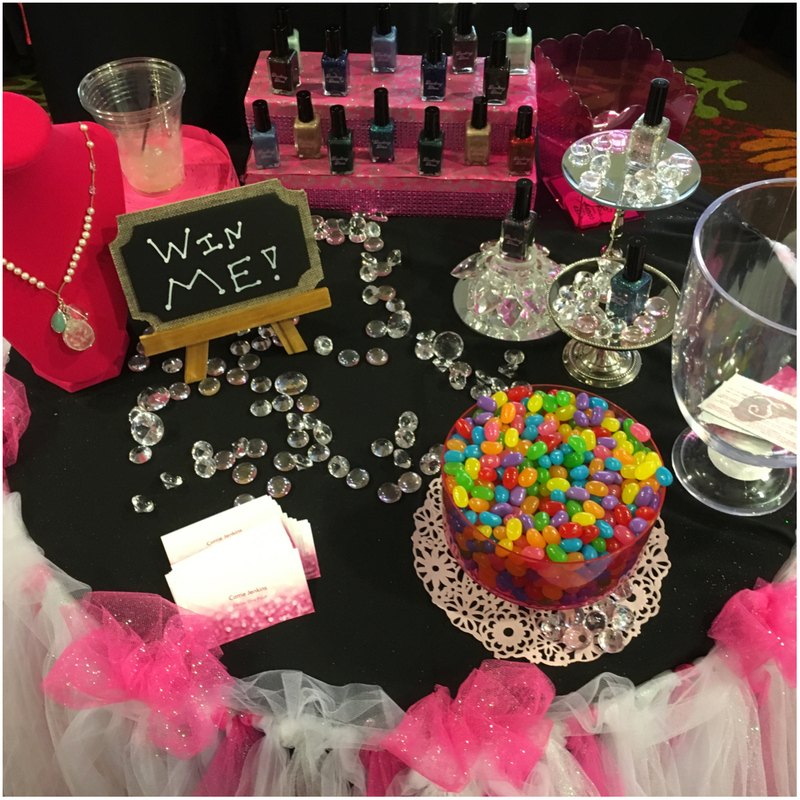 Ashlie’s booth had it all. 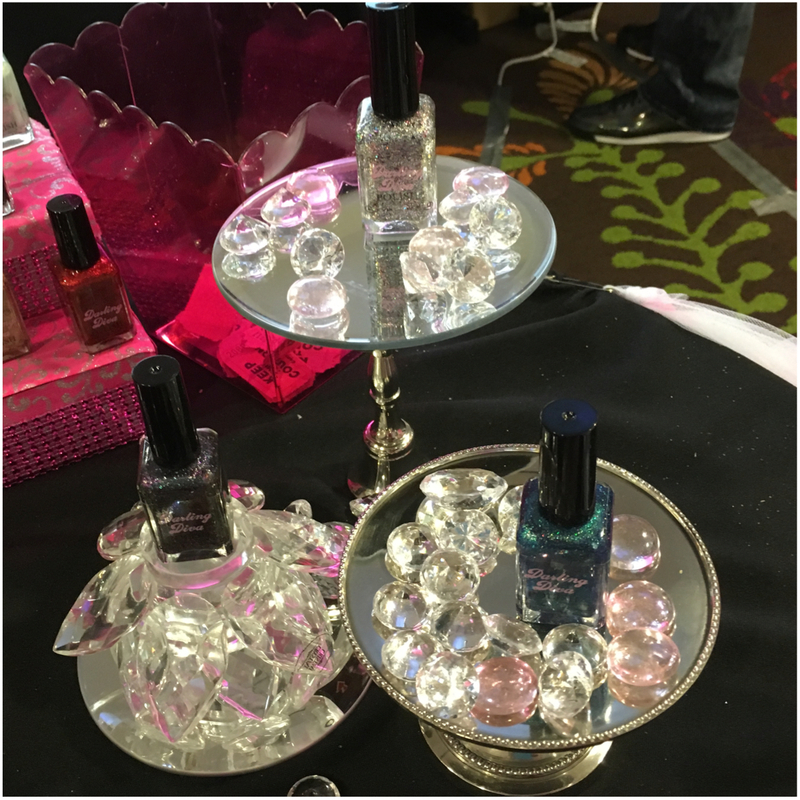 We had gorgeous lacquers, cuticle oils, mani bombs, and more. She is so sweet and I will certainly be buying from her in the very near future. 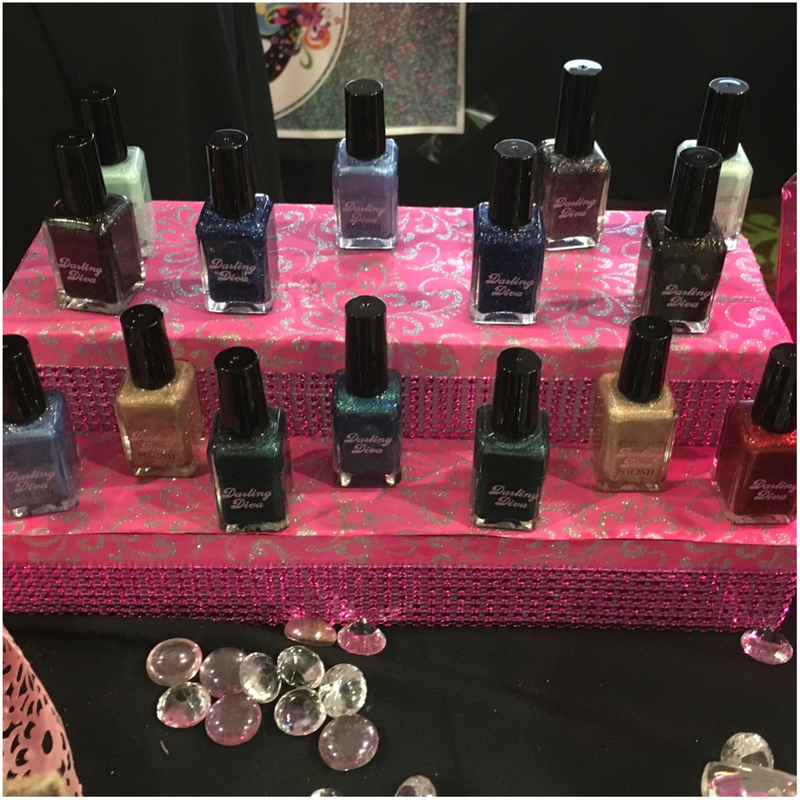 Next up we have Joy Lacquer. 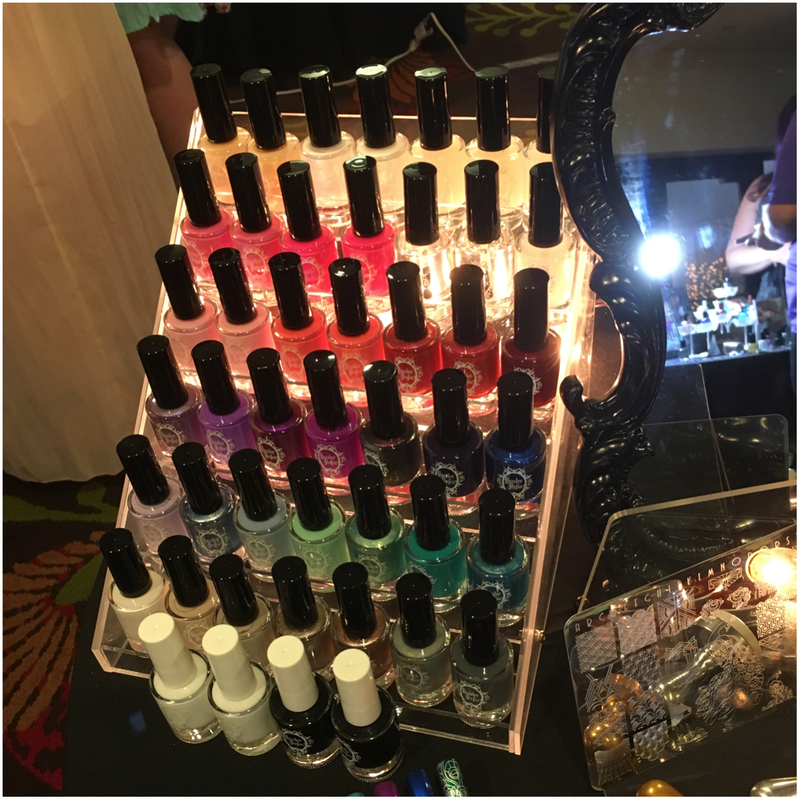 Joy had tons of her lacquers on display along with some of her and body line. 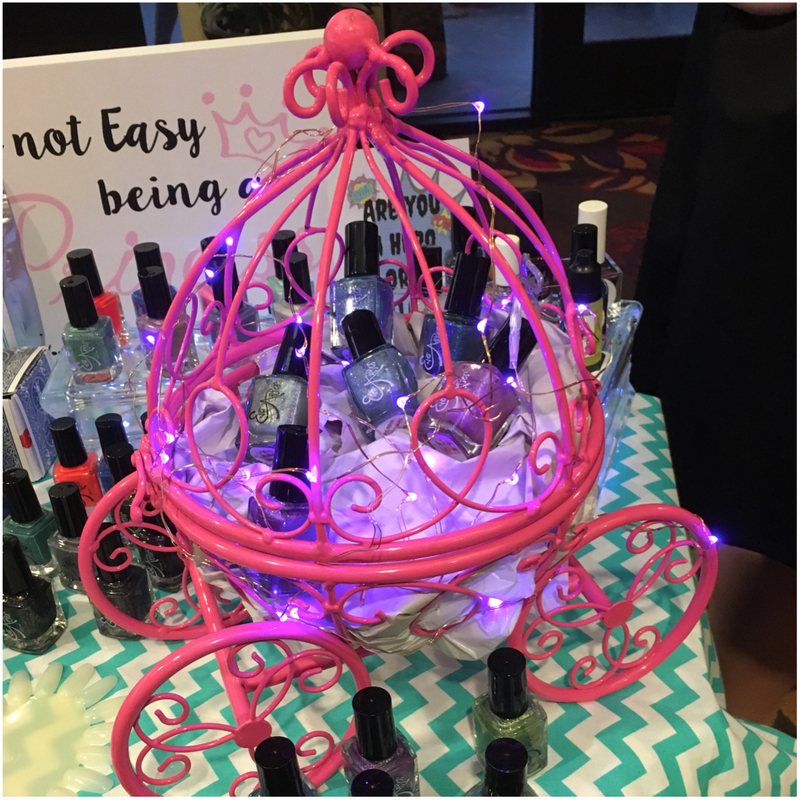 The Pedi Spray smelled amazing is certainly going on my to buy list. 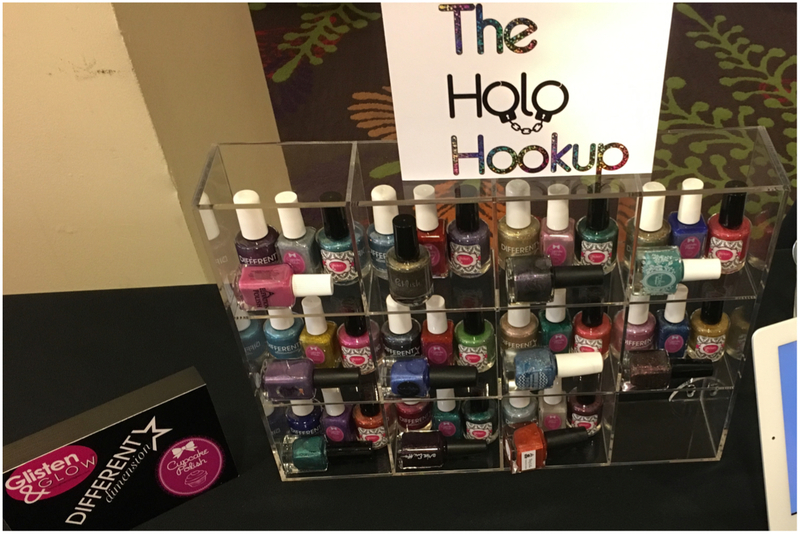 Another cute display this year was past Holo Hookup Boxes. Loving these boxes and while August preorder have come and gone, keep an eye out for September’s reveal soon! Next we have have Ever After. Her display was so adorable, I love the carriage, and being able so smell all these jellies and crellies was a real treat. I need a few of them asap! Now for Colors by llarowe! 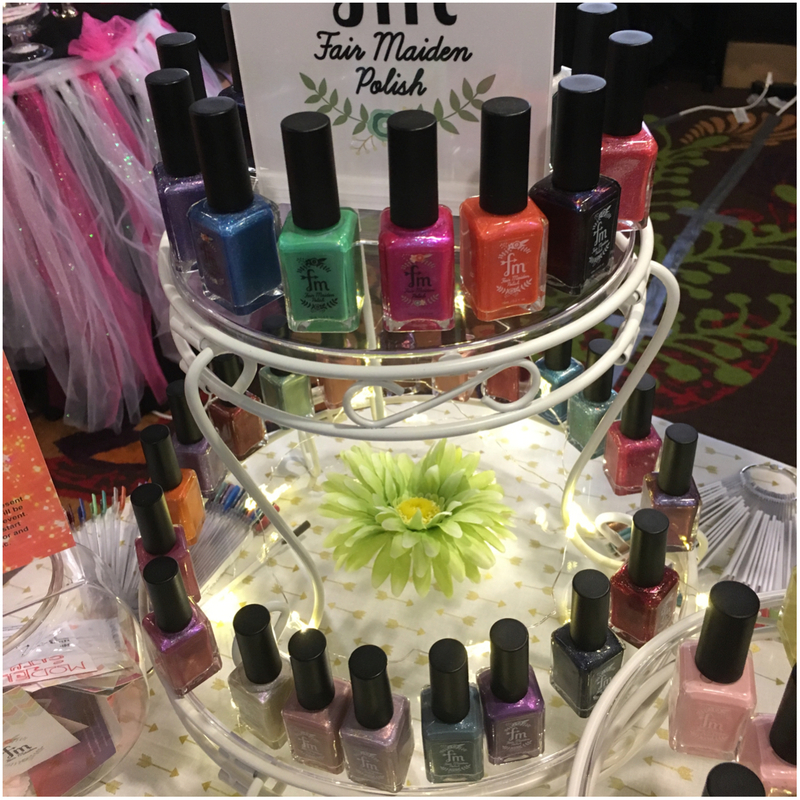 Leah Ann had tons on display and it was great being able to see all these lovely lacquers in person. She really does have something for everyone! Next up we have Lou It Yourself. 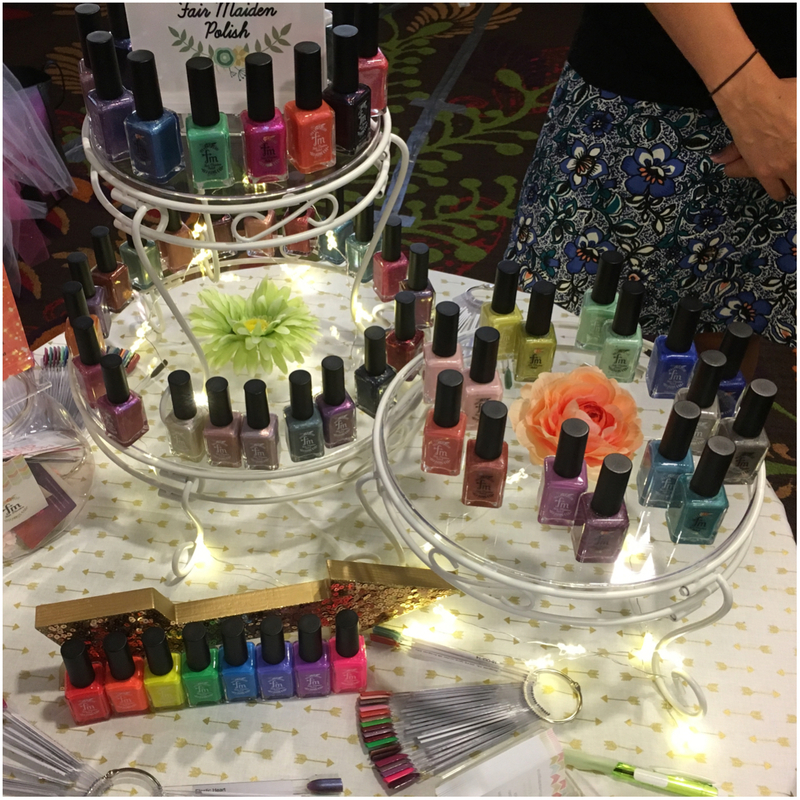 Lou had some of her lovely lacquers on display along with great bath and body products. 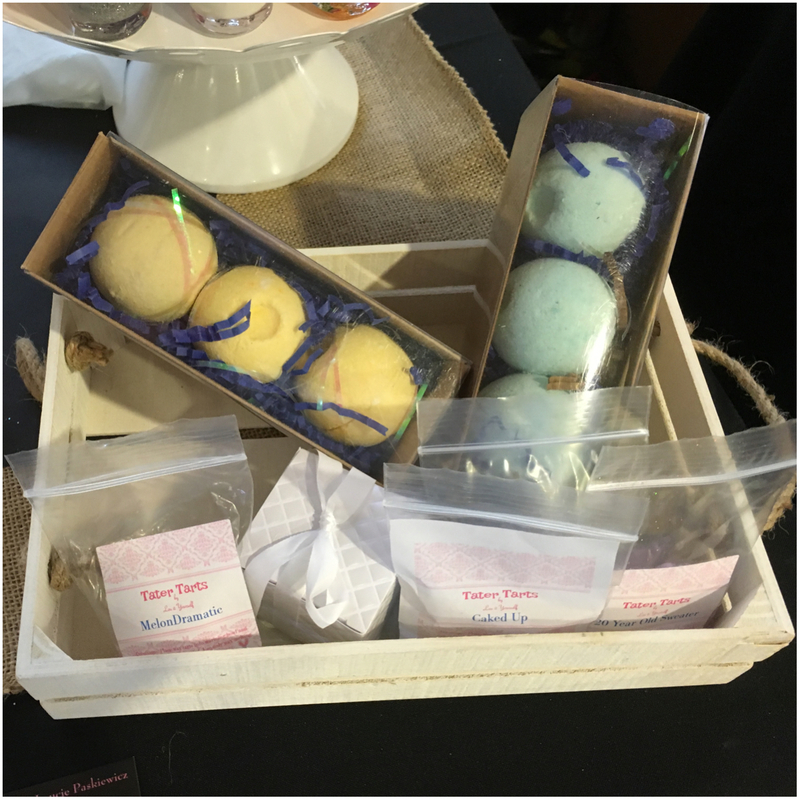 Now I have a new place to go for my bath bombs!!! Now for a brand that I have been a fan of for a very long time. 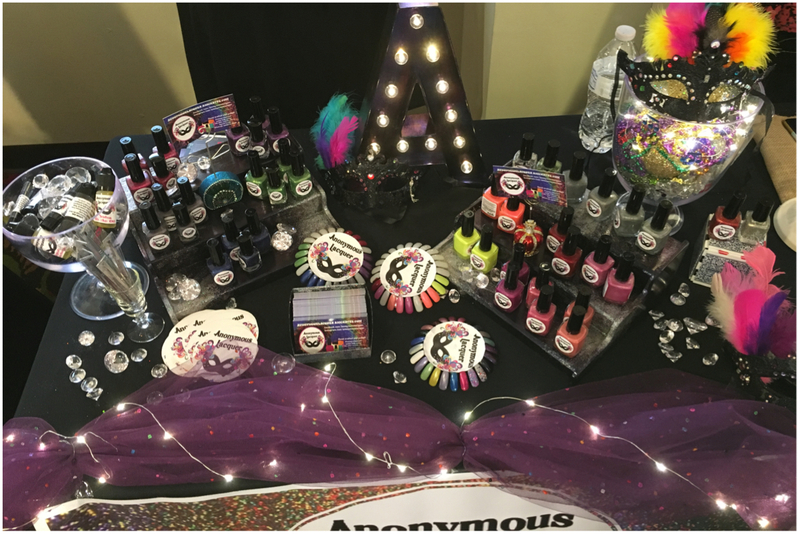 Carrie from Darling Diva has a ton of gorgeous lacquers with cute geek themes, like her amazing Watch Your Pack Collection. 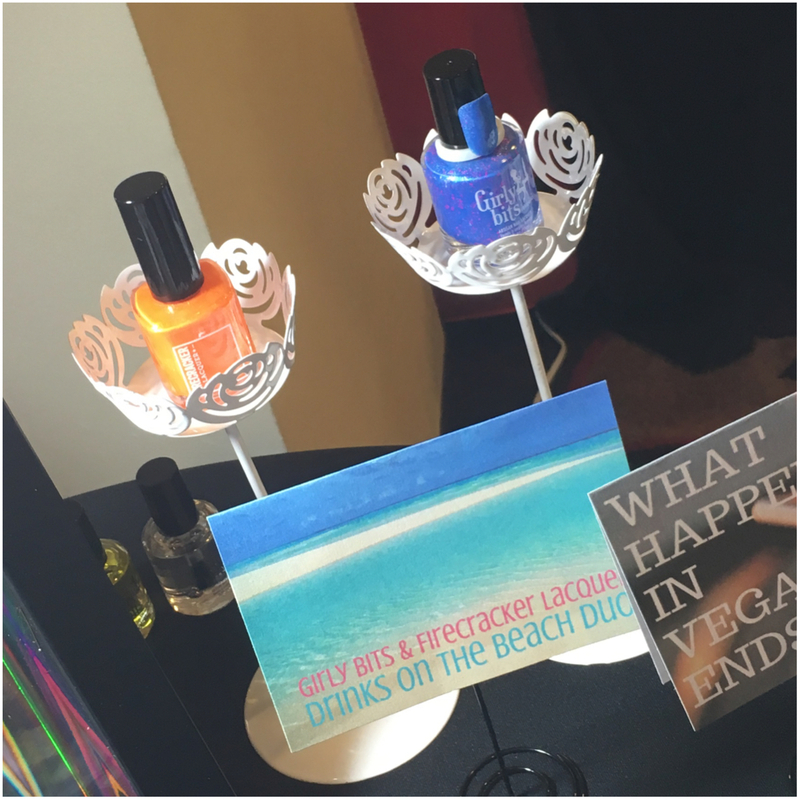 Another great collection on display was this year’s Vegas themed lacquers. 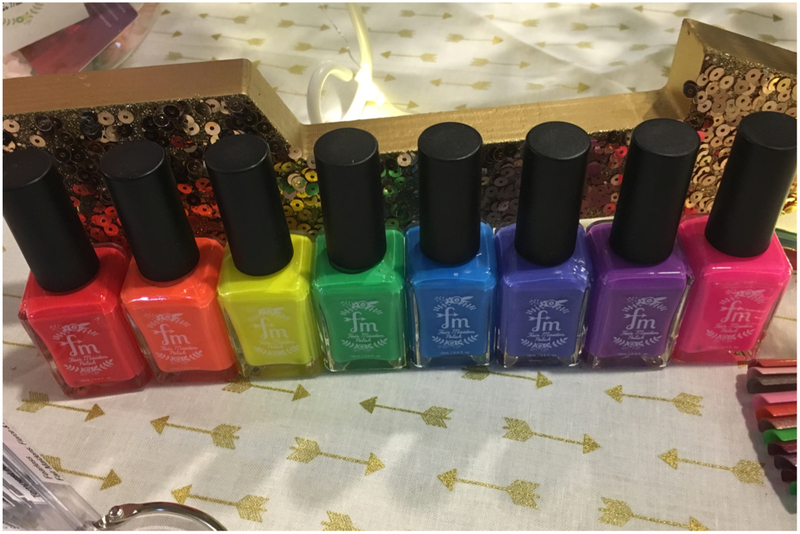 Now for some Fair Maiden! 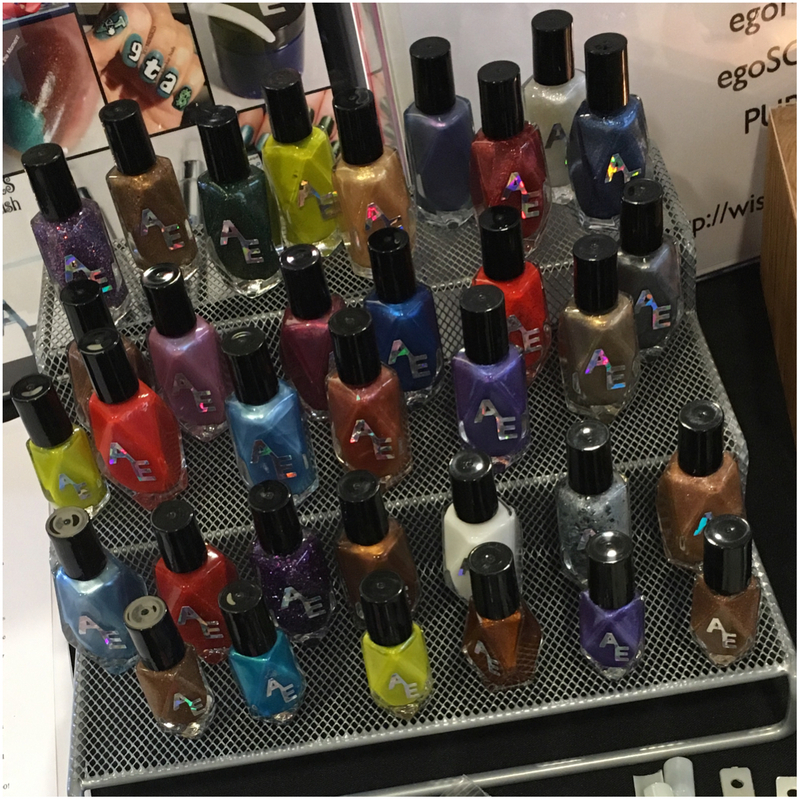 Adreinne and Sarah had tons on display, including their Rainbow Brights Collection. 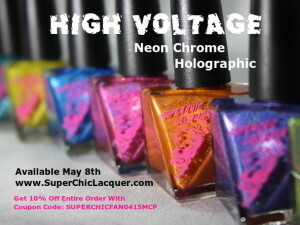 I totally need those neons right now!!!! 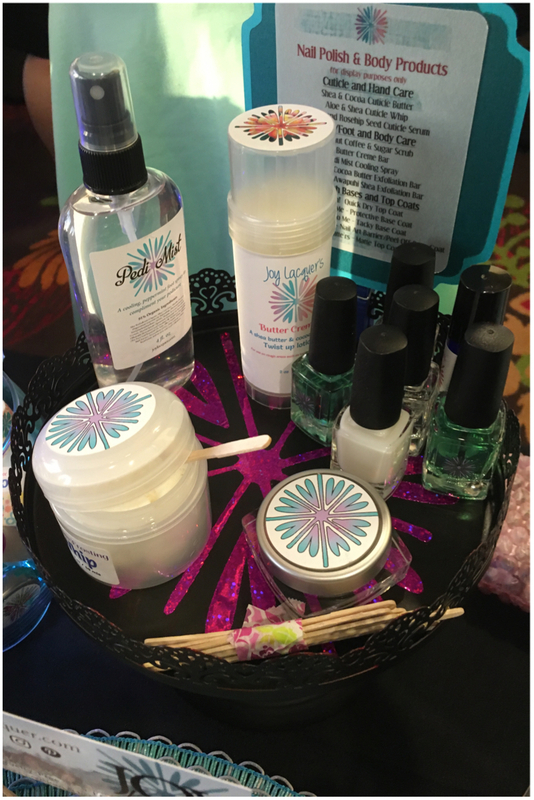 Lastly but certainly not least we have Powder Perfect! 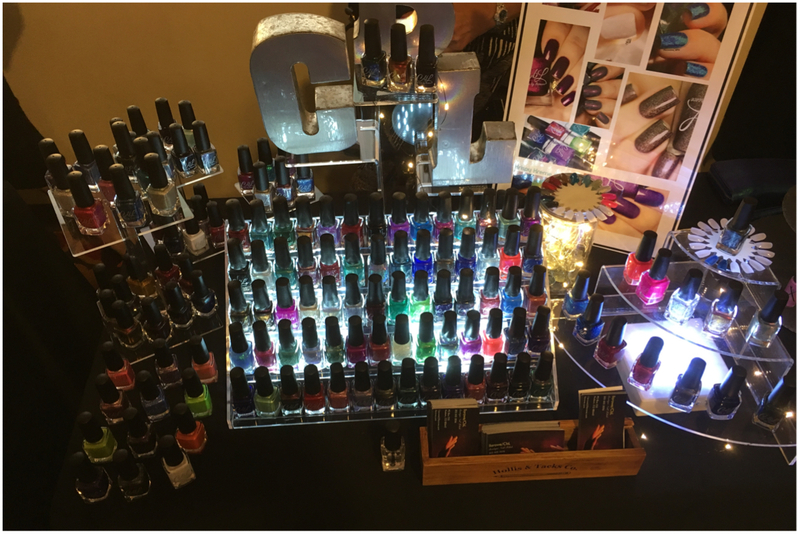 Jacinta traveled all the way from the Great Down Under to share some of her amazing lacquers. 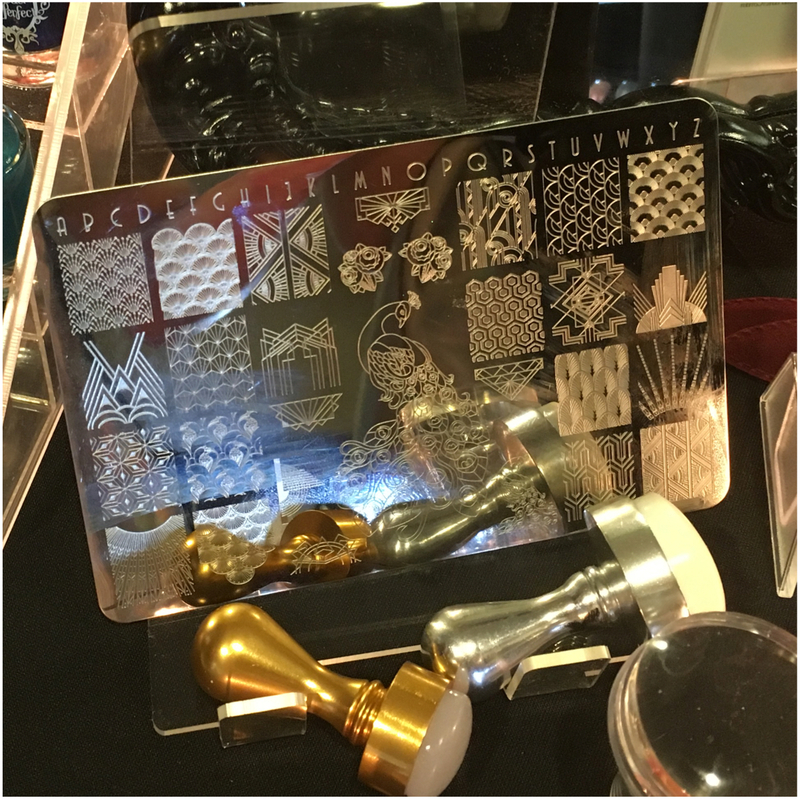 I was immediately in love with all the stunning lacquers and I have already warned my husband that I will be buying this new stamping plate once it is released. How could I say no to this amazing art deco plate?! 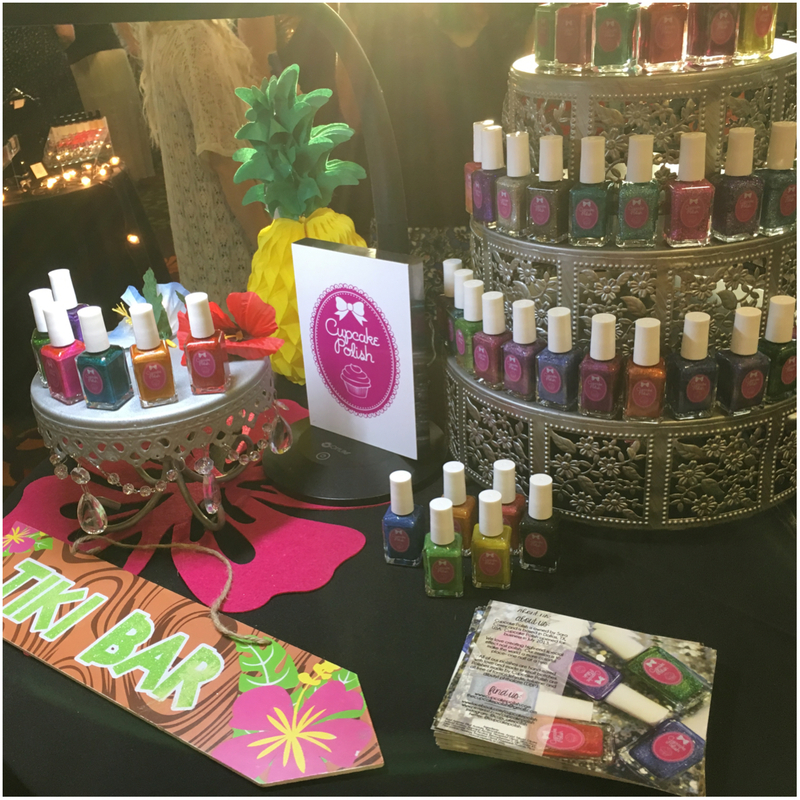 Now not only were we treated to tons of amazing indie brands. There was delicious food, gorgeous views, and great company. 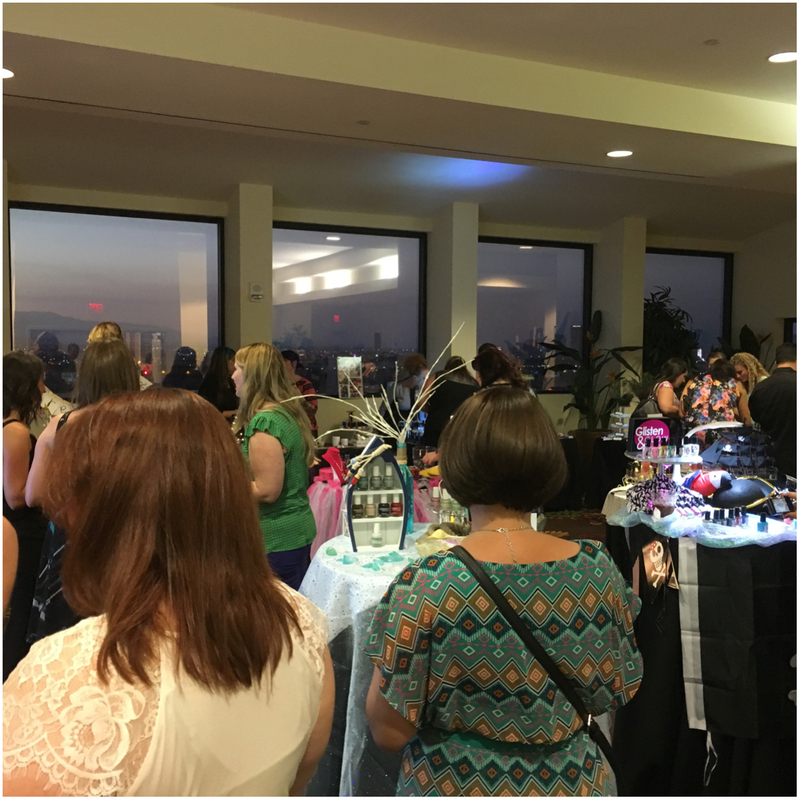 I seriously love this event and I can not wait for next year!!! You didn’t show your dress!!! 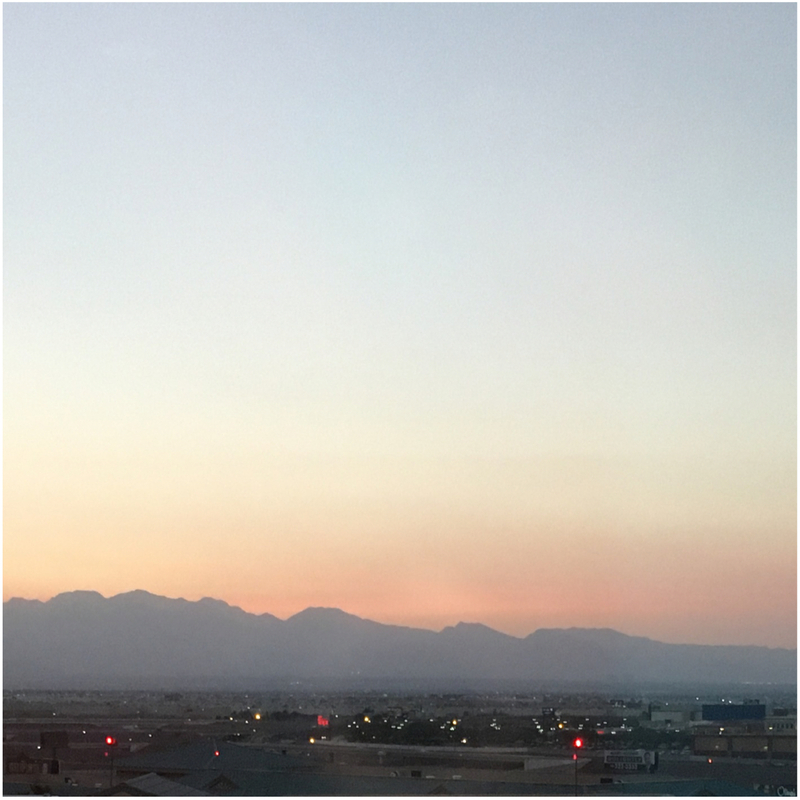 I had a great time this year – so much to see and do! I can’t wait for next year!!! Oh my gosh. So much amazingness in this post. I loved the whole thing, so I don’t even know where to begin with a comment haha! 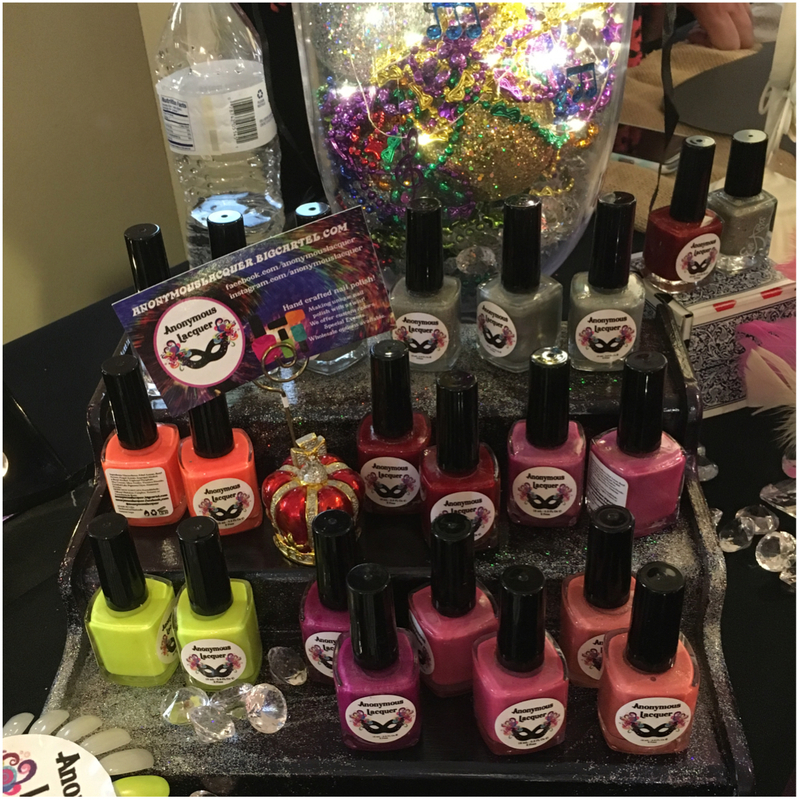 I’d love to go to Cosmoprof, mostly so I can go to this event! 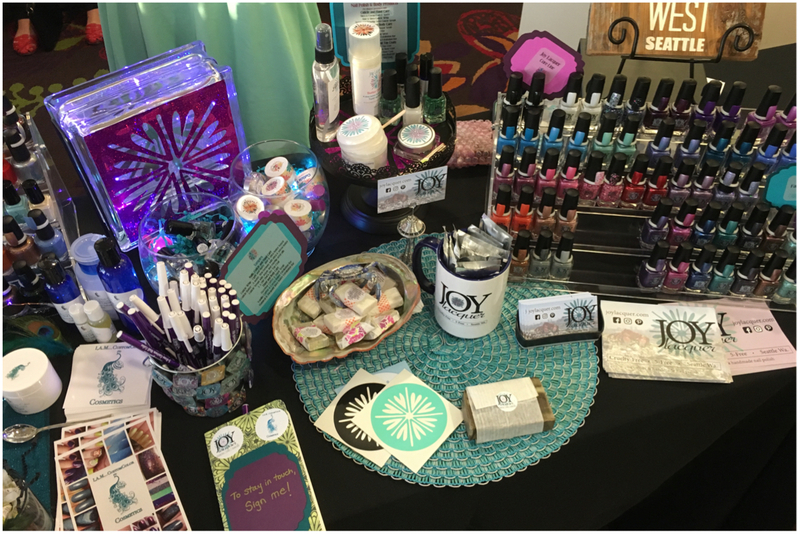 It was so much fun, but I still missed out on meeting a few people…like you! This looks like a blast! I have got to go to this next year. Everybody’s displays looked great! I am so jealous. I would have loved to be there. Your dress was truly the highlight of the night. It was so good to see you again! Oh my goodness, this event looks like it would be SO MUCH fun to go to! 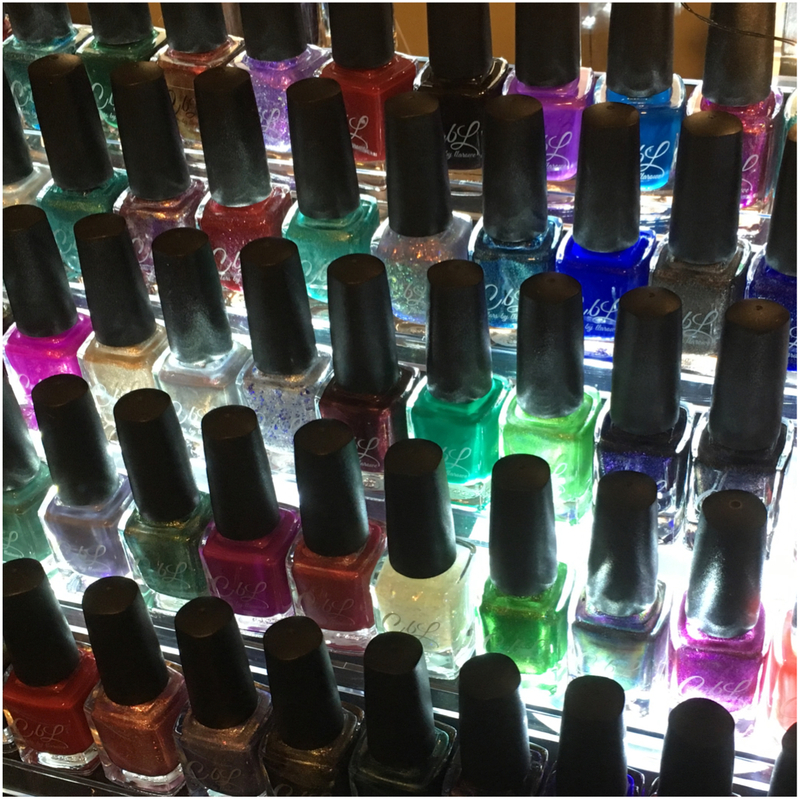 Nail polish galore, I’m jealous!! OMG! 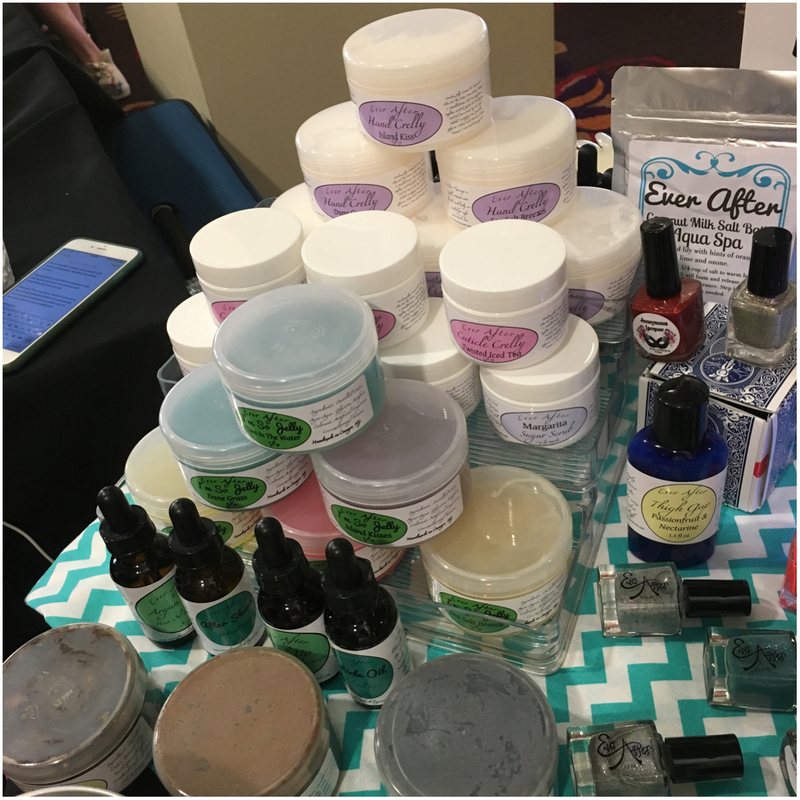 So many indie brands! Love it! 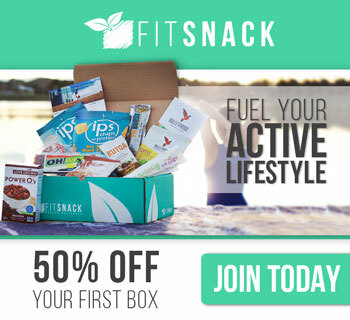 It’s always great to see so many brands coming together! Hoping I can attend next year.